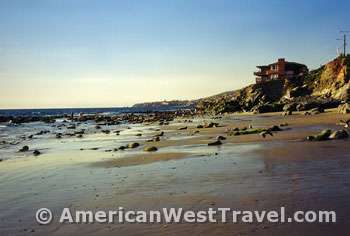 Laguna Beach is one of southern California's most desirable resorts with a wide range of amenities and activities. Its oceanfront is lined with beautiful beaches and parks with steeply rising hills offering a scenic backdrop. The inland access route, Laguna Canyon Road, travels one of the state's prettiest canyons. In the 1920's, many artists discovered the area's beauty and took permanent residence in the town. They were followed in the 1930's by many Hollywood personalities. This gave the town its reputation as an "artists colony". From these early residents, Laguna Beach developed a tradition for fine arts. The Festival of Arts was started in 1932 and eventually grew to include the world-famous Pageant of the Masters. The Hollywood types founded the Laguna Playhouse in 1920. The Laguna Art Museum is one of the state's oldest. Dozens of art galleries throughout town offer a wide variety of original artwork for sale. Historic Gallery Row is located just north of downtown. The Festival of Arts and Pageant of the Masters are Laguna Beach's most well known events. Both are held during July and August in Irvine Bowl Park, a natural canyon amphitheater. The Festival is a top-rated art show featuring the area's most accomplished artists. The Pageant is a unique stage-show where world famous works of art are re-created with human models to the accompaniment of narration and an orchestra. The nightly shows are always sold out, and ticket reservations must be made well in advance. Call (949) 497-6582 or (800) 487-3378 for information. However the beautiful beaches and ideal weather continue to be the town's premiere attractions. The very mild winters and very mild summers make Laguna Beach a year-round destination. Wide, sandy beaches are interspersed with scenic bluffs and rocky points. 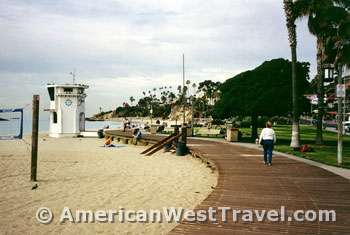 Main Beach (photo right) in downtown Laguna is the center of activity, featuring a boardwalk, basketball courts, and beach volleyball, as well as a sandy beach. Heisler Park is situated on the bluffs just north of Main Beach. The park has walking trails with very scenic vistas as well as picnic and barbeque facilities on well-manicured lawns. Also, look for public art displays. Laguna Beach holds sentimental value for me. Migrating as a young man from the East many years ago, it was my first stop. I fondly recall staying at a run down, old resort for $75 per week. (Today, that resort is an upscale bed and breakfast with rates of $150 per day or more.) Nowadays, my favorite accommodation is the Laguna Brisas Spa Hotel. I enjoy the in-room spa and the unusual rooftop deck featuring swimming pool, scenic views, and cool breezes. Further, the section of beach (about one mile south of downtown) below the hotel is quite interesting. A rocky point delimits a long section of sandy beach. The rocks contain fascinating tidal pools, which can be explored at low tide. Completely underwater at high tide, partially exposed at low, these pools contain a variety of easily observed marine life such as mussels, crabs, anemones, and small fish. There are plenty of great places to eat. Las Brisas is one of the most popular. Located in a classic building on the bluff adjacent to Heisler Park, Las Brisas features upscale fare from the Mexican Riviera, particularly seafood. The scenic patio has large fire pits for cool evenings. If you'd like a weekend spot on the patio (or even inside), make reservations several days in advance. My personal favorite is the Beach House. Located right on the beach, with outstanding views through picture windows, the Beach House features a wide variety of creative seafood entrees. A small, outside patio overhanging the beach offers intimate tables for two. For those who like hiking and unspoiled beauty, Laguna Beach is completely surrounded by wilderness parks, open areas, and reserves. These areas offer hiking trails as well as opportunities for mountain biking and horseback riding. Marine preserves offers places for snorkeling and scuba diving. For more information, call (949) 497-8324 or visit http://www.lagunacanyon.org, the site of the Laguna Canyon Foundation. 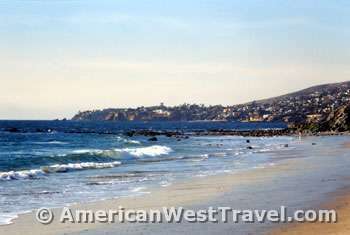 Laguna Beach is located on Pacific Coast Highway, about fifty miles south of Los Angeles. For more information, contact the Visitors and Conference Bureau at (800) 877-1115, or visit their very informative web site at http://www.lagunabeachinfo.org. Featuring 87 trips from serene summits to sparkling beaches, Afoot & Afield Orange County covers the Laguna Coast, Newport Beach, Crystal Cove State Park, the Chino Hills, Santa Rosa Plateau Ecological Reserve, the Santa Ana Mountains, and more. Trips range from short strolls to rigorous daylong treks, and are all within a short car trip of the Southland's cities. There are few places in the American West that offer as many things to do and places to see as Southern California. You may find activities on the beaches, in the mountains, or at an endless number of historic, cultural, and entertainment sites. From I-405, take the CA 133 exit south for about nine miles to reach Laguna Beach.